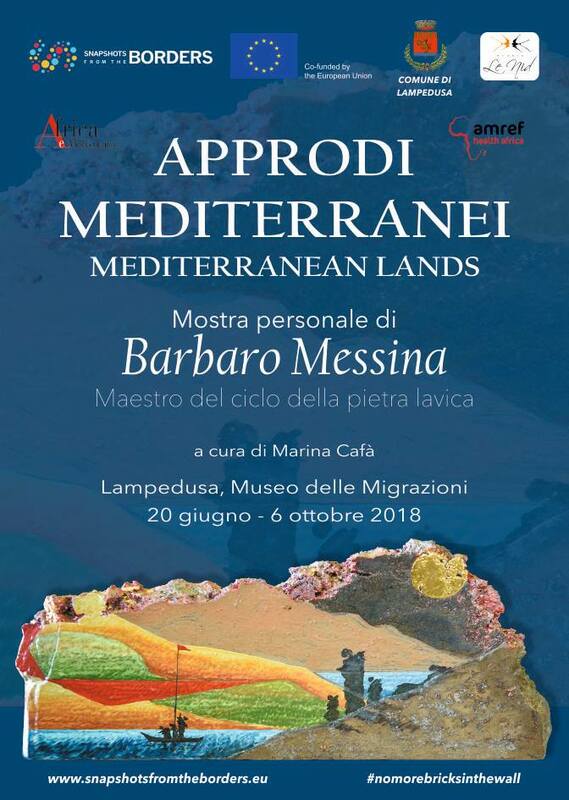 Mediterranean Lands (in italian “Approdi Mediterranei”) is the title of an artistic exhibition organized in occasion of the first town event of Snapshots from the borders, last 20th June, in the municipality leader of the european project, Lampedusa. The exhibition is a collection of the artist Barbaro Messina’s artworks made by lava, the typical stone from the sicilian volcano Etna. We have asked to Marina Cafà, the curator of the exhibition, which will be visitable until 6th October in the Migrations Museum of Lampedusa, the meaning of the project. 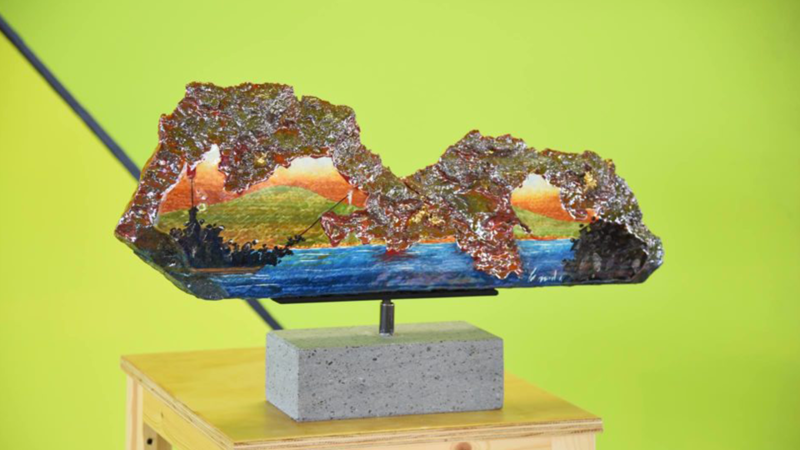 Why the artist uses the lava? The artist Barbaro Messina likes to define himself a “son of Etna”: he feels a deep and visceral connection with the volcano. Etna is considered by the inhabitants of towns nearby like a “Great Mother”, of which they can also perceive the breath. It is precisely this link with the Etna area, which pushes him to seek new artistic solutions in the field of ceramics, material with whom he has worked since he was a child: so, in the late seventies, he started using the new combination of painted ceramics and lava stone from the Etna, whose fragments are collected directly by him inside caves of lava flows. Identity seems to be a central theme in Messina’s artworks: in which sense? Storytelling, like an ancient «aèdo» (in ancient Greece, the professional singer and storyteller), about the territory where he was born, is the focus of the art of Maestro Barbaro Messina. He valorizes traditions and the history of which we are heirs, maybe without consciousness. Art for Messina has, therefore, the role of handing down, as a book or a song, the memory of the origins and our Sicilian identity, most in general. Castles, “faraglioni”, outcropping lava, brooms and citrus groves, relive on the rough lava stone fragments collected by the artist himself inside the volcanic caves, and on the slabs of polished lava, which blend well with the painted pottery; the etnea artistic figurative repertoire is so represented with ancient myths, legends, dueling knights, kings such as Frederick II of Swabia, and the typical Sicilian carts, are represented by Master Messina with the ever-present background of the volcano already called by the Greeks, with the feminine word – “la Montagna” that is “the Mountain”. Snapshots from the borders is about migration: which could be the role of art about this phenomenon? The sensitivity of this truly original artist goes beyond the homage to the tradition and the contemplation of the nature, it reaches the essence of the human dimension with a thought on the migrations in the Mediterranean, symbol of hope for those who do the cross to escape from injustices and violence. Barbaro Messina dedicates different collections of his works to this topic, telling stories rich in pathos and humanity, to be read like the pages of a book, both in the fragments of polished lava basalt (painted on the front), and in the three-dimensional sculptures (also painted on the back). In these works, landscape, with its physical peculiarities and its bright colors, is metaphor of hospitable and warm kindness of this island.